Turns out this drawing was practice for an illustration I did for Bill Hamilton and Susan Kress Hamilton of Phineas Press. 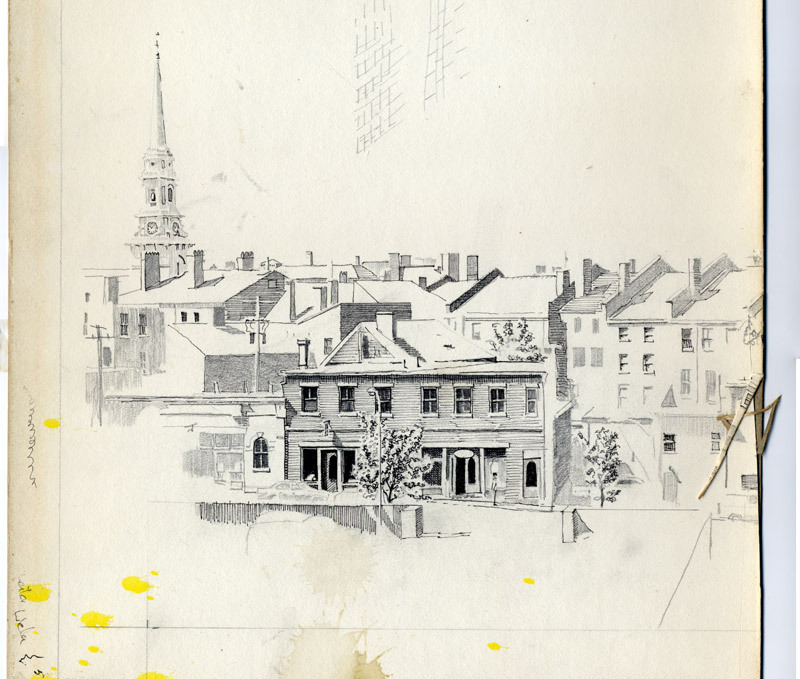 Phineas Press was and still is located in the downstairs left of the building in the sketch, at 108 Penhallow Street. Bill and Susan still run the place and do fine printing and graphic design. In fact –get this — Susan is right now designing the graphics to advertise my upcoming 30-year retrospective at the Discover Portsmouth Center this August. Wicked small world, eh? The image that grew from this sketch was used in an Urban Landscape poster. You will be able to see both the sketch and the poster in the show. What a nice person she is. Wish she did not have to move away. Hi Donna, That is a print, the second edition of that image which was very popular. (I remember taking my college girlfriend out to the Blue Strawbery restaurant in about 1976 or so.) The value is, of course, priceless. Actually, I cannot put a price on it, but I will tell you that those prints (there were two editions of 100 each) sold out at least 20 years ago and I will not making any more of them. I believe there are at least a few people around here who would like one of those, so I expect it is worth a lot more than its original price. Which was probably about $30. I’m glad you enjoy it. B.